Spiderweb turquoise and turquoise wedding ring handmade by Mark Hileman. This handcrafted ring features spiderweb turquoise inlay alternating with plain blue turquoise. The 6mm wide silver ring is masterfully inlaid with 3 pieces of beautiful Kingman spiderweb turquoise and 4 pieces of blue turquoise. The spiderweb turquoise is light blue with a nice tight black spider web matrix. The ring is hand signed "MMH" by Mark McBride Hileman on the inside and stamped sterling silver. Many customers have chosen to wear this style ring as a unique wedding band or man's engagement ring. This ring is shown in a size 10 for scale. This ring will be made to order in your ring size by special order. Please allow 3 to 6 weeks for us to make your new ring. 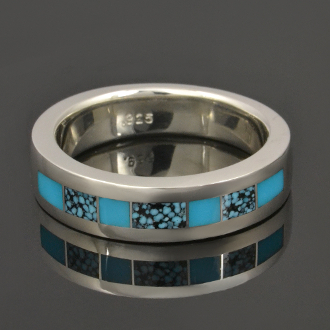 This ring may be customized by choosing different inlay materials or other metals. Contact us for details.